Excellent choice when working with Multiwall Paper Bags. 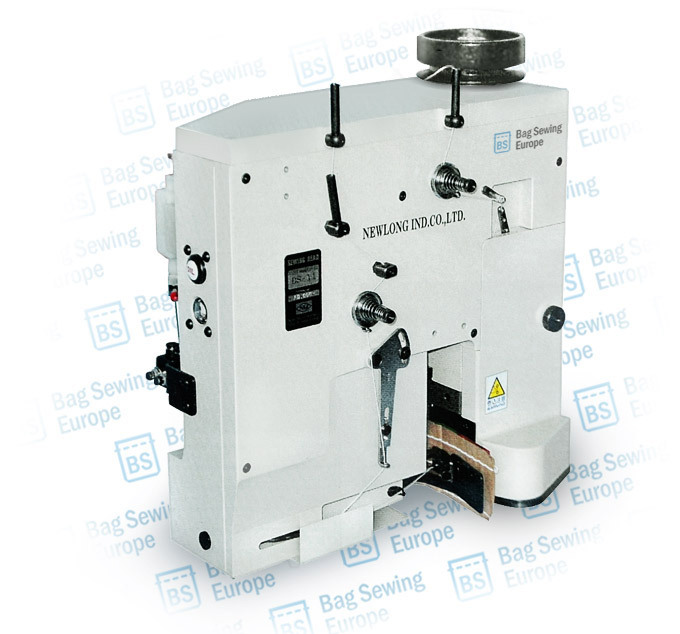 This machine is simular to the Doboy D-95 sewing machine but has enhanced features such as a lubricated Oil Bath. A Special designed single needle double thread chain stitch bag closing machine head with continuous motion feeding system for heat sealing. Equipped with pneumatic guillotine type crepe tape cutter. Closeup of the Feed rollers of the Newlong Industrial DS-11. Both feed rollers are actively driven. There is minimum damage to the bag. 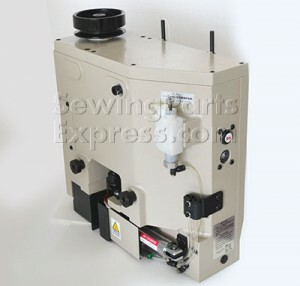 Easy access cover to thread the Looper thread of the Newlong Industrial DS11 Sewing Machine and access the parts and inspection of the sewing machine. The Newlong ds-11 can be integrated in a variaty of systems. 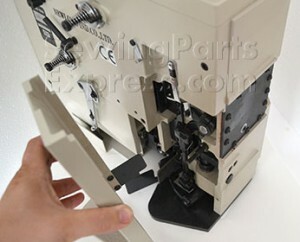 The 3 connection points on the side of the machine can act as sliders / rollers (compatible with Doboy System) or can be fixed with the screws and a special bracket to a A1-PB Pedestal. An integrated oil bath makes the machine run smooth at high speed. The extra oil pump provides oiling to the parts that are not oiled via the automatic lubrication. The pneumatic Crepe tape cutter of the newlong ds11 cuts once per bag through crepe tape and the thread at the same time. Watch the video of the Newlong DS-11 in action. In this example it is combined with a sealer system. Newlong Industrial DS-11 integrated in a system that adds hotmelt tape on a bag. it is the ultimate way to prefent sifting. 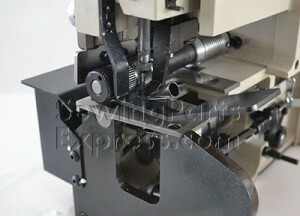 Automatic swing needle machine specially designed to operate as an integrated part of sealing system. Features continuous motion feeding; the timed needle moves in epicyclical rotations as the bag passes through the sewing head. Power driven feed rollers ensure accurate feeding of the bag and avoid damage to the sack, which can sometimes be caused by a feed dog. Model Newlong Industrial DS-11 is equipped with pneumatic guillotine type crepe-tape cutter. Revolution Speed reaches Max.2000rpm（Standard 1800rpm）. Oil-Bath and Oil-pump system. Bearing-used Revolution part for endurance. Built-in Timing Belt for Feed Roll for breakage of belt caused dust. The Newlong Industrial DS-11 is a continuous, rather than intermittent, feed machine; it its most suitable for tape-over closures in an automatic packaging line. Bags are held firmly between chains, throughout travel, until they are finally closed. There is no possibility of a bag coming off the sewing machine during travel. All Power driven feed rollers ensure accurate feeding of the bag and avoid damage to the sack, which can sometimes be caused by a feed dog. Model Newlong Industrial DS-11 is equipped with pneumatic guillotine type crepe-tape cutter. Revolution Speed reaches Max.2000rpm（Standard 1800 rpm). Oil-Bath and Oil-pump system. Bearing-used Revolution part for endurance. Built-in Timing Belt for Feed Roll for breakage of belt caused dust.